Please Note: This article contains political commentary. It’s been some time since I posted any Q updates and that’s been for a number of reasons. First, I’ve realized that I have been too emotionally invested in the whole thing, which kept me from doing other things that I needed to accomplish. Second, because I cannot spend as much time as many of the Anons to sift my way through things, often, Q’s crumbs/posts become a bit clouded to me. Third, the 8Chan boards have become overrun with shills, something Q said would happen, so to use those boards for research means sifting through the many posts that are completely worthless. Whether there are individuals who complain about and blame “the Jews” for everything, or simply those who attack Q and those following him as a LARP, the process of determining the facts needs to be undertaken by people who have far more time than I do. Fourth, while I still have some faith in Q and the crumbs he drops, I’ve also realized that if the Deep State (DS) is actually going to be cleaned up, allowing the Swamp to be drained, it’s simply going to take a good deal more time. Yes, it’s been over two years and one would have thought that if there is any truth to what Q has revealed, things would have been rolling along at a quicker pace. If it is true that Q team has “everything,” then the question I continually return to is why the wait to reveal things? It just seems to me that this long wait simply gives more time for the Swamp and DS to come up with a plan to circumvent anything that Q team has against them. Of course, I could be wrong – I’ve always had a problem thinking 4th dimensionally or trying to wrap my brain around 4D chess – but that’s the way I think. If Q team released an avalanche of truth and reality, my thinking is that it would overwhelm mainstream media so that they could not keep up. Others disagree with that thinking, believing instead it would simply numb people to the truth and they would ignore. In either case, what I’ve learned is that IF things are going to progress as Q seems to indicate, it will simply take more time. If there is a “plan” in place, the plan then has taken into account these eventualities including the timing. Obviously, if military tribunals are to occur, the only avenue for appeal in those instances is the Supreme Court. To have a lopsided court that ignores the tenets of the Constitution would not work here because those found guilty in a military tribunal might be let off with a Supreme Court that leaned Left. Kavanaugh is now on the court, to the chagrin of the Leftists who tried to keep him off, in spite of their accusations which had no evidence, no merit to them at all. It’s really a disgrace what happened and so predictable. Anyone the Left doesn’t want is accused of sexual misconduct – “she said” times many. So I’ve taken a bit of a back seat from the Q thing for a while, allowing others to do the grunt work and publish their results, which is more rewarding to me because I simply don’t have the time for it. There are some very dedicated people on the ‘Net who routinely come through. I’m not saying I simply accept what they say as gospel, but if they make sense, they make sense and their results then are worth considering. Most of the information I find is on Twitter. In spite of their desperate censorship of many conservatives and patriots alike, there are still very solid people who spend their time decoding and researching and publishing their results. They do so for free, however, some are willing to take donations for their trouble. All of the people I pay attention to do not “charge” for their information. You do not have to sign up and/or pay to see their results. They freely share their research. If you’re on Twitter, these are some (not all) of the folks I pay attention to and many of them have been referenced by Q himself. The “threadreader” app is an app that “takes all of the individual tweets in a particular thread and “unrolls” it in one place for easier reading and dissemination. If you choose to read Lady Qanuck’s thread, you’ll find it there in one long scrolling thread. She has done quite a bit of research and her results are gratifying. I’d recommend checking it out. The gist of her thread is that, based on President Trump’s EOs, things will really begin moving after January 1st. In fact, at least one EO does not take effect until that date. We also know that the new members of Congress are not sworn in until January 3rd and people like Jeff Flake have already tried to derail President Trump’s judicial appointments by vowing to vote “no’ on all of them. Flake ran for election as a Republican and claims to still be but clearly, he’s as much a RINO as John McCain was as he stands against everything President Trump is attempting to do for America. Flake will be gone soon as he did not seek re-election so apart from possibly getting hired by CNN or some other MSM outlet, we won’t have to put up with his nonsense in Congress. However, Mitt Romney has been elected (Utah), and even though he ran as a Republican, he’s also a RINO and will likely do what he can to thwart Trump. The House Democrats have also stated quite vociferously that they will do whatever they can to thwart Trump, including trying to roll back the tax reform and even attempting to impeach President Trump. They have no grounds for it, but I’m certain they will make something up anyway. Things are absolutely heating up and we can clearly see that the Swamp/DS is not going down without a fight. Who can blame them as they have a great deal to lose? The above videos are listed in the order in which they were published. The individual who created these videos has a large following on Twitter and constantly publishes Q-related news and information. The videos are very well done and professional. Fills you with awe and respect for what Q team/POTUS are attempting to accomplish, if it is all true. I lean toward that but I will admit that my patience runs thin a bit at times. A friend of mine who is very well versed in how Marxism propels itself into a society, eventually taking over, tends to believe that America may well be at the final stage before final destruction. He believes this because of all of his study into Marxist propaganda and how they have inculcated themselves into societies throughout history. He tends to see President Trump as someone installed by the DS whose goal is to unite conservatives/patriot into thinking that he is on their side, but in the end we will be seeking and expecting him to remake society, which he will do, but will ultimately come out on the side of the DS. He says there’s a possibility that DS has simply taken another approach in their war to install globalism. He doesn’t 100% believe that, but says it has happened in the past and it’s therefore not unheard of or beyond the realm of possibility. In fact, he would like more than anything for Trump to be above-board and altruistic. He’s simply not convinced because of some of the comments President Trump has made regarding the second amendment and “due process.” I get where he’s coming from though I don’t agree with him. His education has forced him to call into question motives and actions. For him to be correct, President Trump is really a tremendous actor, pulling the wool over the eyes of millions of people. That’s really what it would take. At this point, I don’t buy that and my friend isn’t completely sold on it either. He’s simply very wary. The other problem I’m seeing is that not only the MSM has come out of the woodwork to condemn, criticize, castigate, and ridicule anyone who follows Q, but there are just way too many shills on the 8Chan boards and social networks who seem to be there to simply attack anyone who is even remotely interested in learning about Q so that they can make their own informed decision. It’s really unprecedented. Consider “flat earthers” or people who don’t believe we actually landed on the moon. These are fringe groups of people who are largely ignored by the rest of the world. I’ve run across a few flat earthers on Twitter and I cannot for the life of me understand how they arrive to their conclusions, yet to them, the flat earth thing is real. I don’t see shills or the MSM taking these people on the way they’re taking on Q and those who follow him. Flat earthers believe the earth is a flat disc-shaped thing floating in space. They don’t believe the earth is a square, but that the world is a very large oval, flat on both sides. They argue that all the pictures from space have been doctored. It’s absurd to me to even consider it and the fact that no one really takes the time to go head-to-head with these groups tells me that no one considers it to be that important except flat earthers. Some anons believe that the “CA_J” is referencing “Freddy’s” name and location. In other words, Q knows who the person is attempting to shill crowds of people into believing that Q is a LARP. 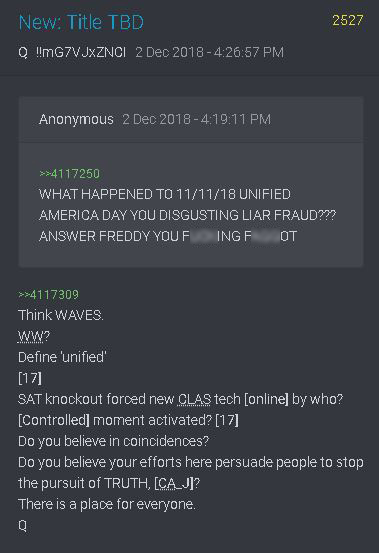 It’s one thing to ask a question of Q, but “Freddy” is just shouting from the sidelines. The question is not whether you want to live under martial law; the question is whether you want to continue to live under the ‘DS martial law’ where the media, courts, prosecutors, tech giants, IRS & every element of the DS is targeting conservatives for complete destruction. However, consider that a Christian pastor (who converted to Christianity from Islam), was just arrested in Minnesota for sharing his Christian testimony at the Mall of America. He was handcuffed to a chair, denied an attorney and a bathroom for HOURS in the Mall. How is this justice? Why was he arrested? Because some Muslims complained because in their view, he transgressed Sharia law, which are not legally upheld in the USA, though Sharia is gaining ground here. I think I can without equivocation state that things are coming to a head in America. If globalists win the day, America will change forever. The stranglehold is more strongly felt in states and areas controlled by Democrats. In those states controlled by Republicans, it is being pushed away. One way or another though, something has to give and if there is any truth to Q, things will change for the better. However, we need to be aware that any future changes will either aid and abet a coming world order or these changes will ultimately be overtaken by those pushing a world order. The Bible seems pretty clear on this. It may not happen for quite some time, but even if all good changes occur within and throughout the United States and other parts of the world, eventually, a one-world government is slated to happen. This is what God has decreed in order to bring things to a global head where He and He alone will face Evil and deal with it once and for all. We cannot stop that from happening. In the meantime, continue to pray, certainly continue to read His Word on a daily basis. Trust God for all outcomes and submit yourself to Him so that He can work in and through you to accomplish His purposes and good will. We’ll be back next time with a close look at 2 Corinthians 1:4-6! Entry filed under: 9/11, Agenda 21, alienology, Atheism and religion, Communism, Council on Foreign Relations (CFR), Cultural Marxism, Demonic, Emotional virtue, eternity, Global Elite, Gun Control, Islam, Islamofascism, new age movement, Political Correctness, Politically Correct, Politics, Radical Islam, Religious - Christian - End Times, Religious - Christian - Prophecy, Religious - Christian - Theology, Romney, salvation, Satanism, second coming, Shadow Government, Sharia Law. Tags: president trump, q, Q movement, q team. Hi Pastor Fred. I marvel at your willingness to dissect cryptic Q ruminations…to me all vain babblings. Nothing will change in Pork City DC with the Establishment regaining 100% control after Trump’s tenure by impeachment or as one term President in 2020. Trump will never prevail against the FBI, an autocratic independent branch even under Hoover who always got what he wanted, because he had dossiers on every pol. As the late AG Robert Kennedy observed when urged to fire Hoover “you cannot fire a god”. The Trump era will be an unexpected and transient hiccup in DC Establishment politics….soon to be reset to corrupt liberal Obama politics as usual. Note how many current Trump supporters are deserting him like rats on a sinking ship to ensure their political future in DC. “In the meantime, continue to pray, certainly continue to read His Word on a daily basis. Trust God for all outcomes and submit yourself to Him so that He can work in and through you to accomplish His purposes and good will” ……until the imminent Rapture of all true followers of Jesus……leaving the lukewarm CINOs and unbelievers to suffer the unprecedented chaos during the ensuing Tribulation. Until the Rapture, Christians are here to “rescue the perishing, care for the dying” or eternal damnation in a literal fiery hell upon death… according to the ever truthful Jesus who more than anyone else in the Bible spoke about the reality and unimaginable eternal suffering in hell (e.g. Luke 16;19-31). I tend to agree. I find the whole Q thing a bit fascinating by way of mysteries & puzzles. It also amazes me the things people come up with regarding Q posts. That said – and I’ve said this numerous times as you’ve noted – is that it doesn’t really matter what, if anything changes in society because of the ultimate unfolding of God’s plan in Scripture. Yes, even IF everything Q said was true, things would absolutely revert to build toward a one-world government anyway as that is forordained. We’ve seen this ebb and flow throughout history. We may see that ebb and flow continue until the time is right and things ultimately move to their final, God-ordained conclusion.